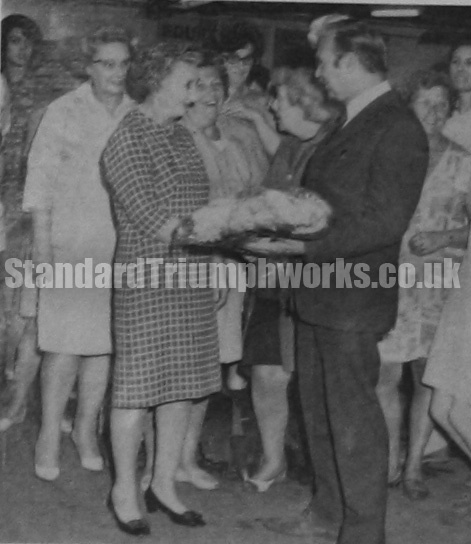 Winnie started in the old trim shop when Albert Jones was Foreman and Olive Friswell was Supervisor. She spent happy years there until the 1939 War broke out. 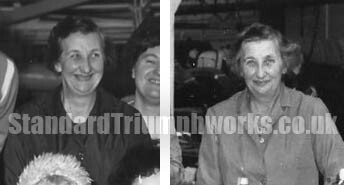 During the war years Winnie worked on aircraft in our Coventry workshops. Afterwards, she moved to Radford for some years, and eventually returned to the Balcony Trim Shop behind Ivy Cottage, until retirement. Mr. Gordon Hook, Deputy Manager, Assembly Division, presented Winnie with many gifts, including: sum of money, breakfast set, shopping bag, bouquet, etc. He also praised her splendid service. Winnie intends to remain in Coventry with her sister. She will enjoy her garden, and touring the Cotswolds in her sister’s Triumph Herald.